Setting up the Dell printer on a Wi-Fi network is easy and requires a few parameters to be met. You should have a network name and password to connect your printer, a computer connected a wireless network previously, software installation CD or wireless utility tools (if any), a router, a wireless-enabled printer, and a good working broadband internet connection. 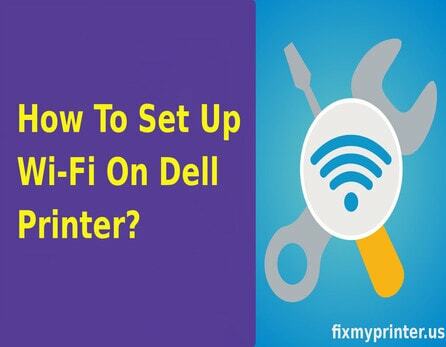 There are two to three methods that you can follow on how to set up wifi on Dell printer. But this document provides you how to set up a Wi-Fi network on a Dell printer for various versions of Windows operating system. Make sure that the SSID or the network name of the printer is appropriate. Print a network test page to confirm whether the SSID is correct. Keep the correct password (WEP/WPA key) to enter when required. Place the printer and the computer within the required wireless range to avoid signal frequency problems. Check whether the Wi-Fi indicator light is ON and not blinking. Ensure that you connect your Dell printer to your computer’s wireless network. Make sure that the computer is not linked to a VPN. Do not keep any objects between the devices to avoid any obstruction. Step 1: These steps work if you are Windows 10 user and trying on how to set up wifi on Dell printer. Check if your printer and computer are connected using a USB cable. Type Wireless Setup Utility on your computer’s search box. From the list of results, click Wireless Setup Utility and go with the prompts that appear. Step 2: At this point, the printer searches for the list of available nearby wireless networks and shows them on the screen. When you find your network name, click on it and then click on Continue. Key in the network passcode and the Allow Dell Software window appears. Click OK or Continue if it appears. If you are prompted to take the USB cable from the printer and computer, do it and the printer is now set up on the network. Step 3: If the network name is not listed, then click on Unlisted Network, provide the Network Name and click Continue. Choose the router’s network security type, click Continue and then type the network key. If the Allow Dell Software window appears, remove the USB cable from your computer and printer and now, the printer is set up over the network. Step 4: If the Wireless Setup Utility tool is unavailable, then connect the printer using the WPS method provided your printer should contain the WPS option and the router must contain the WPS button. Press Setup, Network Setup and then choose WPS Push or PIN method from the printer’s control panel. If you choose the PIN method, an 8-10-digit numerical pin appears. Enter the PIN on the router’s security page. Now, click on the Wi-Fi icon for the printer setup. Step 5: If you are a Windows 8/8.1 user, the same procedure applies as for a Windows 10 user on how to set up wifi on Dell printer. The location of the search box alone changes due to variations in the Operating system version. Step 6: Windows 7 users can follow these steps for set up wifi on Dell printer. Unlink the USB cable from the printer and the computer. Click Start->Programs->Dell Printers->Dell Printer Home->Settings->Wireless Setup Utility and now, the printer starts searching for the nearby available networks and list them. Step 7: When you see your network name in the list, click on it and then Continue. Enter the network password if prompted and the Allow Dell Software window may appear after some time. If it appears, click on OK or Continue. Step 8: You should remove the USB cable from both the printer and the computer when prompted to do so. Now the printer Wi-Fi network setup is complete. Step 9: In case of an unavailable network, click on the Unlisted Network tab and provide the Network Name and then click Continue. Step 10: Choose the Network Security type of the router and click on Continue. Now, enter the network password. If the Allow Dell Software window appears, remove the USB cable at that time when instructed. Your printer is now set up on the Wi-Fi network by properly followed on above steps of how to set up wifi on Dell printer.